Purcell-Gates, L (2014) Puppetry workshop / Demo and discussion. 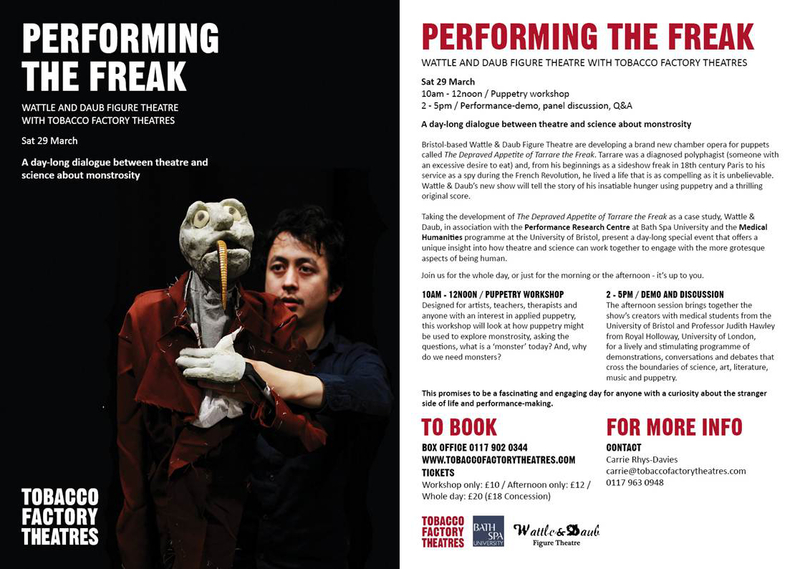 In: Performing the Freak: a Dialogue Between Theatre and Science About Monstrosity, 29 March 2014 & 13 June 2014, Tobacco Factory Theatres, Bristol, UK. This public engagement event brings together artists from Wattle and Daub's puppet chamber opera 'The Depraved Appetite of Tarrare the Freak' with medical humanities scholars and students to explore biomedical history issues raised by the show. The event was performed at Tobacco Factory Theatres, Bristol on 29 March 2014, and as part of Bath Spa University's SenseAbility Festival on 13 June 2014. It will run alongside the 2017 UK tour of the show, funded by the Wellcome Trust. The puppetry workshop was designed for artists, teachers, therapists and anyone with an interest in applied puppetry. It looks at how puppetry might be used to explore monstrosity whilst asking the questions, what is a 'monster' today? And why do we need monsters? The demo and discussion brought together Wattle & Daub and the Performance Research Centre at Bath Spa University with students from the Medical Humanities programme at the University of Bristol and Professor Judith Hawley from Royal Holloway, University of London. There was a programme of demonstrations and debates that crossed the boundaries of science, art, literature, music and puppetry.